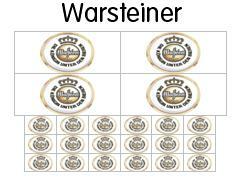 Decal- /sticker set of beer brand Warsteiner. The set contains 4 large (brick 1 1/3 x 4) and 18 small decals (brick 1x2). Nearly invisible transparent layer through a water based process. Decals have to be cut, but cutting lines are indicated. Because of the transparent layer, you get the best results on a background with a light colour (for instance white, light gray, tan).